for the same state homicide rate, people are less likely to be shot by cops in states where Black people make up 10% or more of the population than in states where people make less than 10% of the population. Relative to the rest of the population, there is an elevated homicide rate (both offense and victimization) in our Black population. 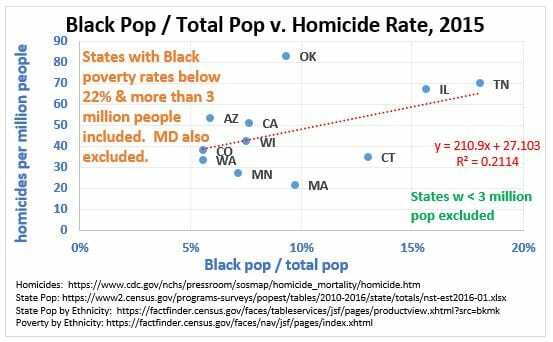 Thus, if we want to reduce the homicide rate, perhaps the opportunity is greatest in understanding why the homicide rate is as high as it is in the Black community. 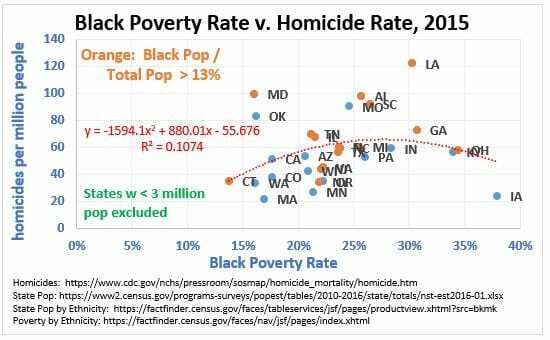 While the homicide rate is lower in states with less poverty (median of 42 murders per million v. 58), there is no clear pattern that would indicate that poverty rates the Black community are a primary driver of the murder rates according to the above graph. If that isn’t clear to you, the graph below includes the same information but from a different perspective. 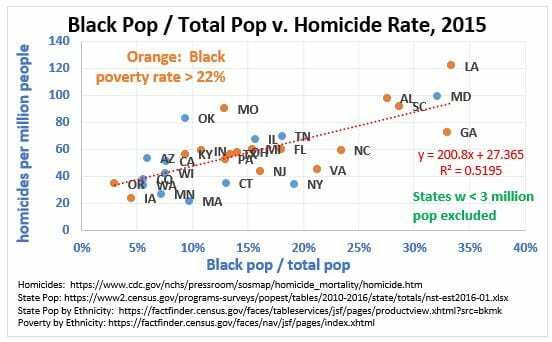 So the data seems to indicate that reducing poverty in the Black community, while a laudable goal for any number of reasons, is probably not going to have a strong influence on the homicide rate. This post is getting long so it’s time to wrap it up. I would note that it goes without saying that it would be tremendously useful to find ways to reduce the homicide rate and reduce the number of victims, particularly in the Black community. 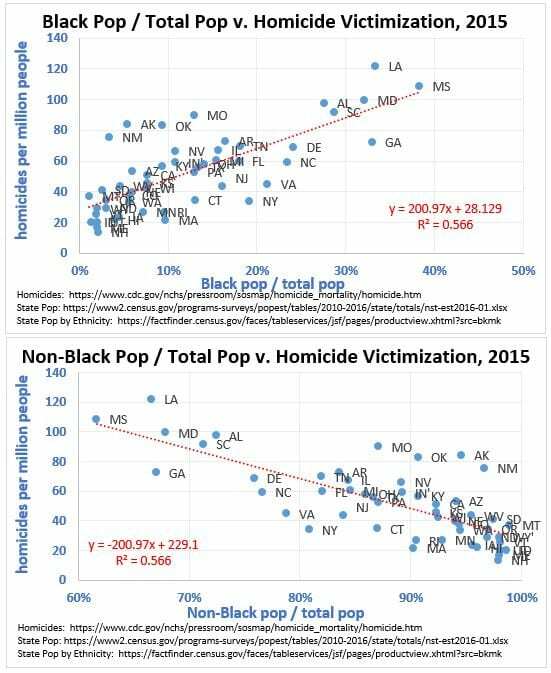 One final note… if anyone knows where I can get data on the homicide rate by different population groups by state please let me know. behaviours but the causal mechanisms are questioned. To investigate whether childhood family income predicts subsequent violent criminality and substance misuse and whether the associations are in turn explained by unobserved familial risk factors. Nationwide Swedish quasi-experimental, family-based study following cohorts born 1989–1993 (ntotal = 526 167, ncousins = 262 267, nsiblings = 216 424) between the ages of 15 and 21 years. Children of parents in the lowest income quintile experienced a seven-fold increased hazard rate (HR) of being convicted of violent criminality compared with peers in the highest quintile (HR = 6.78, 95% CI 6.23–7.38). This association was entirely accounted for by unobserved familial risk factors (HR = 0.95, 95% CI 0.44–2.03). Similar pattern of effects was found for substance misuse. There were no associations between childhood family income and subsequent violent criminality and substance misuse once we had adjusted for unobserved familial risk factors. The authors found (no surprise to anyone) that kids born into the lowest income twentieth percentile of the population are far more likely to get convicted of violent criminal activity or become substance abusers. But, by accounting for changes in a family’s income over time and how that affected (or didn’t) criminality and substance abuse outcomes of siblings and cousins, the authors were able to conclude that a family’s income was not associated with violent criminal activity or substance abuse except insofar as income was being driven by some other unobserved factor(s) that itself was associated with negative outcomes. That unobserved factor (or factors) runs in families. The authors are not as clear as I’d like in describing the data adjustment, and the process they use is not one I have employed myself at any point. But if I understand the limited description of the process correctly, they are basically noting that a kid in a 60th percentile income family is no less likely to become a criminal than his younger brother will be several years later when the family has dropped to below the 20th percentile of income. Furthermore, within each income level, crime tends to run in families. To take the paper’s findings a bit further, there is a serious implication here: it isn’t so much that poverty drives people into crime, but that families whose members have a tendency toward criminal behavior have an increased likelihood of ending up poor. Perhaps those who lack empathy are both more likely to commit crimes and less willing or able to behave in ways that allow them to get and retain good jobs. Of course, some of the smarter criminals can fake empathy enough to do quite well for themselves. It is also important to note that most poor people are not criminal. Nevertheless, the reason crime correlates with poverty is not that poverty leads to crime, but rather that for a not insignificant piece of the population, criminal tendencies are associated with traits that increase a person’s likelihood of being in poverty. How do We Reduce Misery Caused by Poverty Around the World? So what do these places have in common? It isn’t natural resources. Just ask the Japanese. (Plus, in countries outside of the list above, being blessed by nature somehow correlates with suffering from the “Resource Curse.”) It isn’t Democracy as we know it. That’s a relatively new thing for South Korea, Hong Kong was ruled by foreigners for most of the last century, and then, of course, there’s Singapore. It isn’t coming into the post-WW2 period wealthy; quite a few countries on the list were in miserable shape in 1945. It isn’t a matter of exploiting other countries (which Americans of a certain bent are always fond of claiming is the US’ secret) – South Koreans will proudly tell you that the country has never invaded anyone in well over 2,000 years. Switzerland, too, is proudly neutral. The Scandinavians have also been pretty pacifist for well over a century as well. Small government? As much as libertarians like to claim Singapore for their own, ignoring the massive government participation in the economy (think Temasek, Singapore Airlines, Mediacorp, Singtel, Singapore Power, etc.). Nor did Japan, Inc. qualify. Something about about geography and environmental factors that these countries have in common? Nope and nope. Let’s go the other way on this post. Most of us care about poverty. We’d like to see a world with less poverty, and more opportunity for everyone. Put a different way – it would be a wonderful thing if Bolivians, Burundians and Bangladeshis were able to live the lifestyle enjoyed by people of Switzerland, South Korea and Singapore. But wishing is easy. And useless. So… how do we get from here to there in a reasonable amount of time? My answer is that it will take changing the culture. For example, most countries that do well tend to have a reputation for punctuality which is rarely shared in less developed countries. Of course, there is more than just punctuality. Find out what other aspects of the culture of South Korea, to use a specific example, work and export that culture. After all, South Korea was in very bad shape at the close of WW2, and by the 1980s was a force to be reckoned with. If Burundi makes the same transformation over the same period of time, many, many people’s lives will be much improved. But at this blog, a lot of people don’t like “culture” as an answer. For reasons I frankly don’t get, saying culture is a big driver of economic outcomes is viewed is racist by many people. OK. Fine. But if then how do we do it? How do we reduce the misery that comes from the poverty that is so pervasive around the world? Me: I am crying crocodile tears for smokers paying 50% more than the lowest cost insuree. This is a tough pill to swallow for smokers who self-inflict this damage to themselves. The 50% premium for smokers pales in comparison to the 300% above the lowest cost insure, the elderly will pay for just being old a condition which is unavoidable. Come on Louise, you can not be serious. “”So many things fill your mind and you go through so much, you need your cigarette to smoke to calm down and get things off your mind,” says one of the participants, quoted in an article about the study in the March/April issue of the American Journal of Health Promotion. “In our study, cigarette use was defined as a ‘buffer’ for dealing with multiple demands, financial insecurity and daily hassles,” say Bettina M. Beech, Dr. P.H., M.P.H., of the University of Memphis, Department of Psychology and colleague. More affluent better-educated Americans are far more likely to quit smoking than low-income very poor Americans for several reasons. 1) they have a reason to want to live. If you’re a black male who can’t find work, can’t put enough food on the table to feed your kids, and worry about what’s going to happen to them on the street, you’re angry, depressed and stressed. You are far more likely to engage in self-destructive behaviors –smoking, drinking, drugs. No matter how hard you try, chances are slim that your life is going to improve. By charging smokers more for insurance, you increase the chances that they won’t be able to afford it. Given the choice between cigarettes– which they are addicted to and which they associate with relief of stress–and insurance, they’ll choose the cigarettes. Bottom line, when we blame smokers for smoking, we are blaming the poor for being poor. Tobacco companies know why people smoke. Social security cuts offered…why? Irresistible to Obama. There is no crisis with Social Security. Social Security is not going broke. Social Security adds NOTHING to the deficit. Social Security is not welfare. A reader suggested I check the results of the “one tenth of one percent tax increase” against the recent bad news from the Trustees. I looked at the result of increasing the tax one tenth of one percent for each the employee and the employer whenever the Trustees project short term actuarial insolvency. The results were the same as before the recession: an average increase of one half of one tenth of one percent increase on the combined employer-employee tax over the seventy five year actuarial window results in no insolvency whatsoever. The effect of the Recession has been to move forward about six years the date of the first one tenth of one percent increase to about 2018. By 2033 the tax would have been increased about one and a half percent for each, while wages will have gone up about 25%. Workers will have MORE money in their pockets AND will have paid for a longer retirement at a higher standard of living. There is no crisis. Social Security is not going broke. Social Security adds NOTHING to the deficit. Social Security is not welfare. Over the whole century and into the next, the SS tax would need to be raised another one percent, while wages will have gone up over one hundred percent. There will be no debt. But if people are not smart enough to realize that if they are going to live longer they are going to have to put aside a little more to pay for groceries after they can’t work any more, then they are going to have to learn to live on a little less . They could even do that. It wouldn’t be wise, but at least it wouldn’t be as stupid as letting them “fix” Social Security in a way that destroys its value as insurance. And that’s all it is: a way to insure your own savings against inflation, market losses, and personal bad luck. Even against recessions. But unless the people tell the president and the congress… that’s exactly what they will do” “Fix” it.. the way a two year old fixes his daddy’s watch. Which brings me to this review of James Patterson’s new book by John McWhorter in the New Republic. The point of the book seems to be that welfare was bad for Black families. The review cites some interesting, er, facts, which presumably come from the book being reviewed. As such, the refashioning of AFDC in 1996 into a five-year program with required job training was the most important event in black American history between the Voting Rights Act of 1965 and the election of Barack Obama. In that light, Patterson is too saturnine about the Moynihan’s report’s legacy. By 2004 the welfare rolls had gone down by two-thirds, and contrary to fears that people off the rolls would starve or languish in squalor (Moynihan was among those who thought they would), black childhood poverty went down to 30 percent from 41 percent, and ex-recipients have regularly reported greater self-esteem and are thankful for the new regime. Well, if the 1996 refashioning yada yada yada “was the most important event in black American history between the Voting Rights Act of 1965 and the election of Barack Obama,” its something worth a look. Since I don’t have a clue where to find data on self-esteem and thankfulness, let’s have us a look at the bit about how, by 2004, “black childhood poverty went down to 30 percent from 41 percent.” We can check out data on Black childhood poverty from this table at the Census. First, an aside – as of 2002, the Census started differentiating between two definitions of “Black” which is self-evident from the key to the graph above. Other things evident from the graph…. if something in ’96 caused a big drop in Black childhood poverty, it was powerful enough for its effect to work its way back in time all the way to ’93, which is the year Black childhood poverty began its decline. That drop did reach a bottom of 30.2%, but in 2001, not in 2004. In fact, unfortunately, the rate of Black children in poverty rose since then. And when the real facts are placed on a simple graph, its extremely difficult for a rational person to reach so and so’s conclusion. That momentous factor is this: After the 1960s, the percentage of black children with one parent exploded from a quarter to—by the 1990s—nearly three-fourths, vastly out of step with the availability of work, the prevalence of racism, or equivalent single-parentage figures for any other race. Now, I should graph this, but I’m in kinda a hurry, so I’ll just let you know… data on the percentage of Black children’s living arrangements can be found at yet another table at the Census. One of the columns in that table gives you the total number of Black children, and another gives you the total number of Black children living with one parent. Using some of that fancy learnin’, I divide one column by the other and discover that…. 1. 54.7% of Black children lived with a single parent in 1990. 2. That rate peaked (for the 90s) in ’96, at 57.4%, and then dropped to 53.3% in 2000. Anyway, if McWhorter’s review is remotely accurate, call this an “unrecommendation” for Patterson’s book. And a suggestion to McWhorter – if the book cites facts that seem obviously false, check those facts. Because if the key points in a book are ludicrously inaccurate, that’s a big problem that should be mentioned in a book review. And agreeing with stuff that is just plain wrong makes no sense at all.